If you feel a special connection to the school or want to help support our German community, you can become a sponsor by donating goods and services or by supporting the school financially. Please make any donations through the “Donation” link on our homepage. Every September, German ISD participates in Communities Foundation of Texas’s annual North Texas Giving Day, a one-day online giving extravaganza dedicated to raising funds for non-profit organizations in our North Texas community. Your donation will help us receive extra funds. 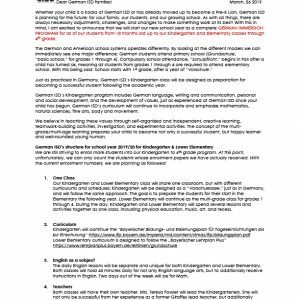 Become part of a dedicated support team to make this day a remarkable day for German ISD (Volunteer sheet). Spread the word to your friends, work colleagues, relatives, and to Omas & Opas – even back in good, old Germany! Encourage your loved ones to get up and give! Follow us on Facebook and stay up to date on North Texas Giving Day! Thank you all for giving! The Weihnachtsbazar is one of our many fundraising events. This year, we are having a “German Weihnachtsmarkt” for the first time to support German ISD. German ISD’s Annual Fund Drive, which is conducted once during the school year, gives you an opportunity to make a tax deductible gift to the school that helps fund a need outside of the regular operating budget. It assists in lessening the costs associated with keeping our competitive programs and in providing the excellent education you have come to expect. At German ISD with every day anew, our students’ faces light up with understanding as they discover the exciting world around them. Your Annual Fund gift supplies the tools students need to open the door to that world. Please join us in enriching your children’s lives by making a pledge today! Our goal is 100% participation by parents, faculty, and board. Reaching a high level of participation is crucial in obtaining outside support, as foundations look for a substantial level of commitment within organizations they choose to fund. Feel free to stop by, call, or email us with any questions. German ISD is in the initial stages of establishing a planned giving program. Gifts have been made to German ISD in the form of bequests. We welcome the opportunity to talk about a planned gift that could be advantageous to both the donor and German ISD. 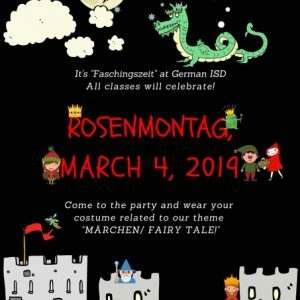 Gifts to German International School of Dallas may be made by cash, e-check, VISA, MasterCard, American Express, Discover Card, by being named beneficiary of a life insurance policy, inclusion in estate planning, or through gifts of appreciated stock. 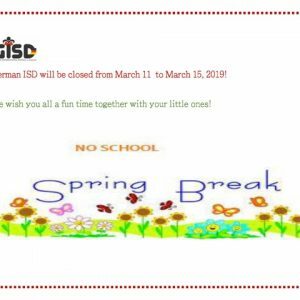 Please contact our treasurer, Nicola Bremer, at 214-507-0130 or email treasurer@german-isd.org so we can assist you in making a gift with which you will be pleased. AmazonSmile: Order from the Amazon website using this link and a portion of your purchase will be donated back to the school. By filling out a short form, the school will receive a quarterly check for 1% of grocery purchases through the Good Neighbor Program at Tom Thumb. The Reward Card number is on the key tag you swipe at the check-out. Please add #13023 to your card. You can download the form under http://www.randalls.com/ShopStores/Good-Neighbor.page? , and turn it in at the Courtesy Booth. Link your card at www.KrogerCommunityRewards.com. Use 28010 to support German ISD.